1. Stick to the basics. Are you like me? Do you have the basic plan and then the basic plan plus? Our basic plan includes reading, writing, arithmetic, and our CC memory work. The basic plan plus is all of that and the fun extras, like crafting, and cooking, and building. Well, the “plus” went in the boxes with all the other things I wouldn’t need during the move and we stuck to the basics. For us, our reading plan and memory work encompasses all subjects so that makes keeping to the basics easy and fun. 2. Keep out only what you need. With packing boxes and cleaning and moving, we seemed to never “do school” in the same room two days in a row. Because we were packing up (and then unpacking), cleaning out, and redoing rooms, we moved school to where we needed to be that day. After a few days of lugging two bags and a bin from room to room, I was wishing I had kept out less. Even though I thought I stuck to the basics, I could’ve gone even more basic. For the most part, during our move and reno, my children were not interested in sitting around piddling with educational toys or even with some of their favorite books. They were busy watching (sometimes helping) everything their dad and I were doing, creating games you can play in an empty house, and exploring our (also empty) new home. I should mention everything I did keep out for us to use, I kept accessible to my littles. There were times I was otherwise occupied, but my crew could keep going with their work, because they could get to it all. Besides their books, my short list of supplies included: pencils, portable pencil sharpener, colored pencils, crayons, erasers, ruler, and scissors. I kept all of these in one big ziploc bag. 3. Pack for longer than you think. We were thrown a few curveballs during our move, including a little delay. One delay caused another delay and so on till we remained packed in boxes for much longer than I originally anticipated. So while I wish I packed less, I also wish I had packed for a longer period. For example, my guys went without their tin whistles for one (or was it two?) week at CC, because I just hadn’t thought that far ahead. Their tin whistles were safely shrink-wrapped into our card catalog in the middle of our packed garage and I wasn’t about to ask my husband to dig them out for us. For one week, they played air tin whistles. 😉 While that’s no big deal, it could’ve been avoided if I had planned further ahead. I should’ve looked ahead in their math lessons too, as one of my sons needed a compass in his later lessons, but he wasn’t using a compass when we first packed up. Again, no big deal, but avoidable. 5. Remember life is a lesson. One of the best parts of homeschooling is allowing our children to learn about life right alongside us. A good friend reminded me of this truth when our son was born last year. During our move, we had some professionals in and out of the house doing jobs. I took every opportunity to say, “Watch what they’re doing! Is it okay if they ask questions?” and “See guys, math! You need math for everything.” My guys looooved it and each of the professionals enthusiastically backed me up. 🙂 But, really, I did encourage the guys to watch and learn from all the things happening around them. Often the best times of learning are unconventional! p.s. ~ Speaking of favorite books, the ones pictured above are some of ours. 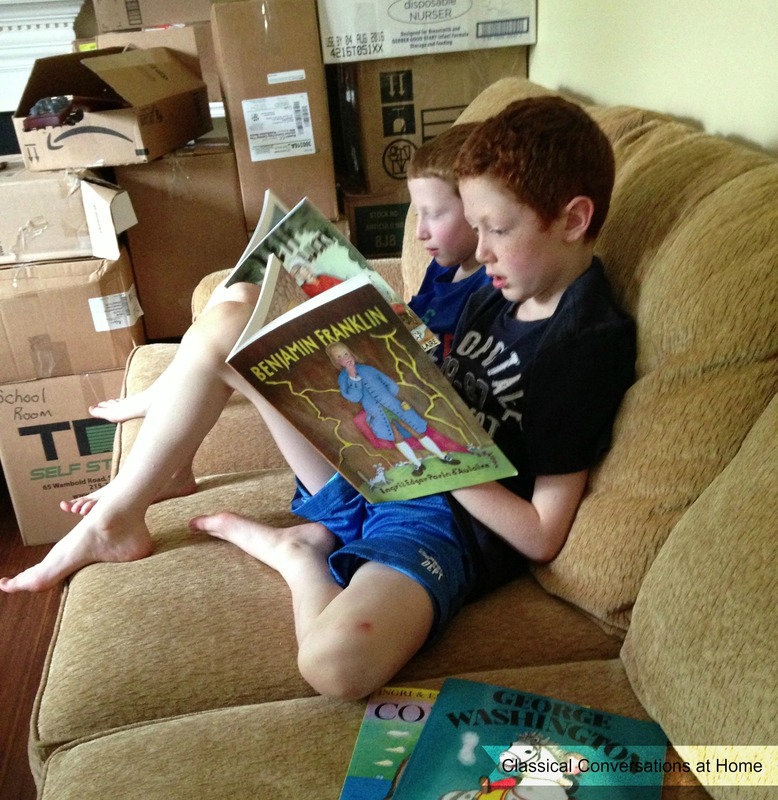 We’ve loved reading many of the kid-friendly biographies of characters from U.S. history. (Benjamin Franklin, George Washington, Abraham Lincoln, Columbus, and Buffalo Bill) Pay close attention to the illustrations – they’re half the fun! Thank you! Packing up now because we’re moving next weekend! Yikes! Alright, Kelly! You got this! It should be very hard to keep the studying routine while moving! Really nice post! Thumbs up! Greetings, Man With Van Croydon Ltd.
You are amazing! Moving house is difficult enough but you even managed to somehow continue with homeschooling your children! We moved house in the summer and it was really difficult to pay attention to the kids during this time, I was so busy with organizing everything and stressing out, that we get really behind with homeschooling. Thanks for sharing! Greets!